Speed bumps and zebra crossings aim to slow down road traffic, but that doesn’t mean every driver obeys those kinds of road warnings. That’s why the city of Ahmedabad, India took painted road instructions a step further, and created optical illusions that look like three-dimensional road blocks when approached from the right angle. 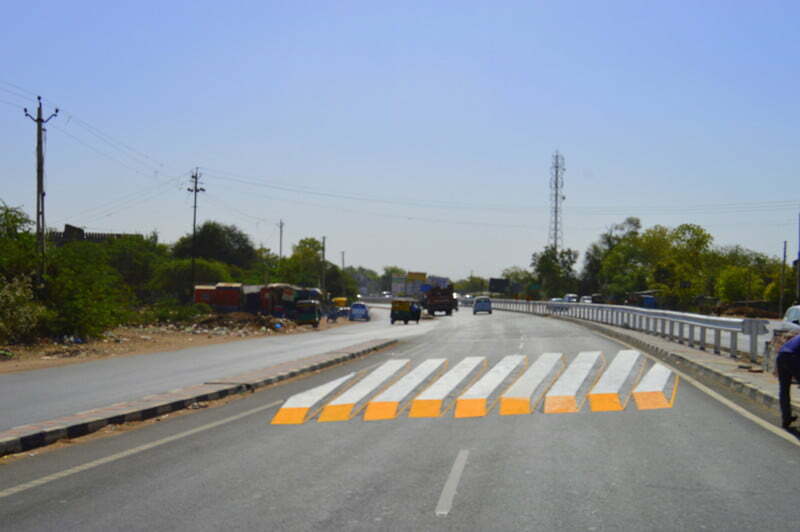 A highway management company in Ahmedabad commissioned local artists Saumya Pandya Thakkar and Shakuntala Pandya to paint the optical illusion crosswalks in school zones. “A lot of school kids were crossing the road, and it was not safe for them because of the high speed of the highway,” said Thakkar. Drawing inspiration from similar crosswalk illusions that had been painted in China, the duo painted a total of four highway crosswalks in Ahmedabad’s school zones. Since completing the project in January, Ahmedabad highway officials have reported that accidents have been eliminated in those four dangerous traffic areas. The illusion is effective because at a distance, drivers’ eyes are tricked into believing there is a three-dimensional roadblock in the middle of the highway. After slowing down on approach, drivers can clearly see that the blockage is an optical illusion as they near the painting, so they don’t brake completely or stop the flow of traffic. If anything else, getting drivers to pay attention to their speeds in active school zones has had a positive impact. “It’s not that dangerous for the drivers, because they can make out that this is just a painting. But the idea is that they pay attention because of the new creations,” said Thakkar. And for any driver with a sense of humor, the optical illusions might even send them on their day with smiles on their faces.